We’ll get to the contest in a moment. Right now, we have to have a little brag book type moment. Due to all changes at the station, there’s a new Assistant Chief. Some call him Bubba, but since here in our little bloggy world we already have a Bubba (our dear friend and chief of another fire station across the county), we’ll call the new Asst. Chief Big Bubba, since he’s older than the other Bubba. Because Big Bubba was a battalion chief, there was a vacancy to fill. Our needs a good nickname pal (he’s been mentioned many times before, but I can’t find a particular post right now) moved up, despite being at the Darius Rucker concert, which I held against him, but clearly, the majority of our membership isn’t as petty as I am. I think in a stroke of vindictiveness, I shall knight him CP – for Cherry Pie. He doesn’t read my blog, and if you’ll remind me, I’ll explain why CP some other day when I need blog fodder. Congrats to Big Bubba, CP and Nephew. Remember who you are and what you represent. Now, back to bloggy stuff. I haven’t done a contest in forever and a day, so this one isn’t too stressful. Just follow the rules and you’ll be entered for a chance to win some goodies, yet to be determined. Do *NOT* post your answer to #2 in your comment. I reply to all comments with a valid email address, so once I reply, you’ll have my email to send me your answer. Breaking this rule will disqualify you, and your comment will be deleted. What kinds of things do you most enjoy about my blog? Be specific. Are you here for knitting content? Do you stop by just on Thursdays (or other days) looking for the fur-girls? What causes you to just skim a post, here or on any blog? 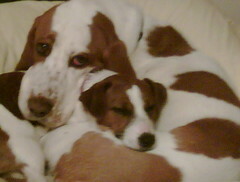 Oh, I hope you can see the photo whether you see Sissy or not!! The weekend is proving to be just as hectic as the week. We’re having dinner tonight with my favorite aunt and uncle, and then tomorrow, another bylaws committee meeting. Sunday I intend to spend the day with the Knight and the fur-girls. The four of us really need some time to just hang out and the girlies need some organized play, which is also known as training! What does your weekend have in store for you? I don’t even know where to begin. It was a fun, full weekend, and we’re not done yet. Go grab a cuppa’ and a snack, and then we’ll see how much I can cram into one post. First, we have to slip back to the contest prizes. More have arrived! It’s not a great photo, but it’s been rainy and/or overcast here since I honestly don’t remember when. The sun almost made it out yesterday for a while, but not when I was at home. 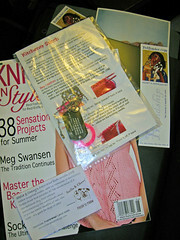 The yarn is a custom colorway from NH Knitting Mama, just for this contest. The colors are some of my favorites, as noted in my recent coffee swap questionnaire. 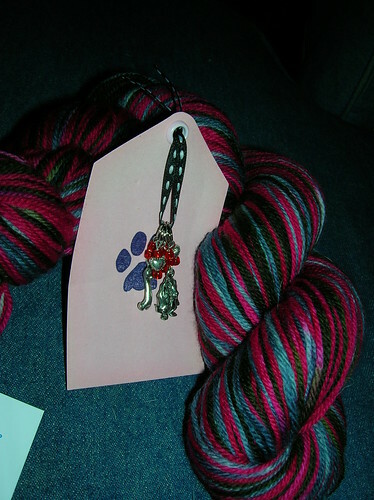 The stitch markers are from InsanKnitty, and while the photo is inadequate, there’s a cute basset hound and a bone amid the ruby red beads. Thank you so much Amanda and Michelle! We had a great weekend. Friday night, we went out to dinner, hit the grocery store, and then sat up late knitting and talking. Saturday, we headed out for Carodan Farm. It was a pretty drive through the countryside, with redbuds and blooms galore, but Caroline was as accomodating as ever. I wanted the April Tofutsies yarn and pattern, so she kindly walked over to her home, unpacked a skein or two, downloaded the pattern, and brought it back over. While Michelle had no trouble finding yarn, I touched everything and yet, I wasn’t moved to buy much. I had this feeling I was leaving something behind. When Caroline asked if she could help, I jokingly asked what she would feature in the shop newsletter that would find me saying “Shucks! 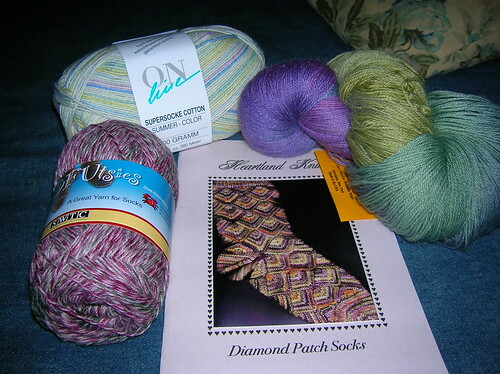 I wish I’d seen that!” She laughed, and left the shop again, returning with Online’s new cotton sock yarn, the whole box, so I could see all the colors, and with some Elsebeth Lavold Bamboucle (which for whatever reason, didn’t make it into the photo). I love that pattern too. The sample was done in Koigu, which of course, I have in my stash thanks to my Red Colorswap pal. I was torn between the Anne and the Heather yarn, but the Anne came home with me. The Bamboucle is a must-see. It’s not so boucle, and it’s actually cotton, bamboo, linen and nylon. I think it will be a little scarf, but who knows?! 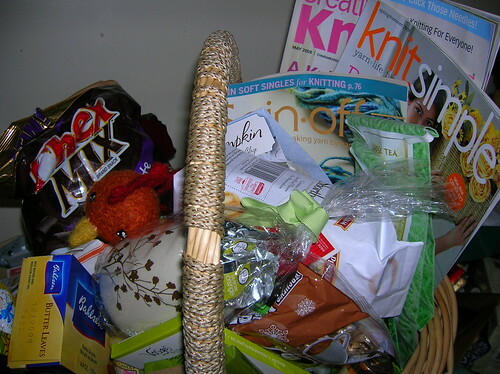 It would truly take all day and dozens of photos to show you everything Michelle had in this basket. There were treats for the dogs, shortbread which the Knight is sure were for him, teas, flavored syrup… and three new magazines. I am going to take a moment to mention that I’m sorry I let my suscription to Creative Knitting expire. They have a new editor, and the whole feel of the magazine is different. (Yes Jessi, that’s Spin Off, and a subscription is in order.) Knit Simple is always a good choice, and the assortment of “tee shirts” they offer is sure to have something for everyone. Love this very sleek mug. Can’t wait to drink from it, and it might get a quick wash for that early evening cuppa’ I’ll need after this long composition. Yes, it’s slightly assymetrical, but that’s part of its charm. 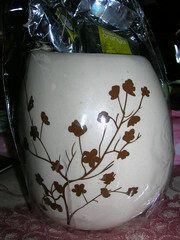 I like brown a lot too, so even without loose tea packed inside, it’s a keeper! Next, there’s a treasure I think some of you will have to special request from Michelle’s shop. (She is indeed the InsanKnitty linked at the top of the post.) 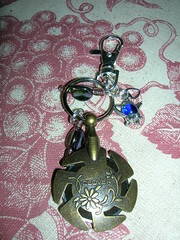 It’s a yarn cutter, taken off the chain, and slipped onto a clip, with some very “me” charms added. I’m still thinking the blue teapot needs to move over to my charm bracelet. 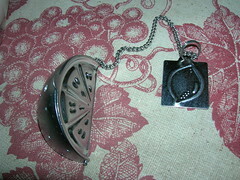 This little baby is going to be clipped on my project bag, and it will go everywhere with me. No more worrying about my scissors on planes, as Caroline pointed out when we were looking at the cutters in her shop. 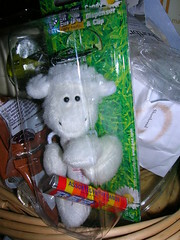 I loved Pez dispensers as a girl, and this little one delights me to no end. Could it be any cuter? It has a hook to be a keyring, but I know that with my life, it would be dirty dingy in no time, so I’ll have to think of a nice, clean place for it to live. The folks at Lindt are so clever. 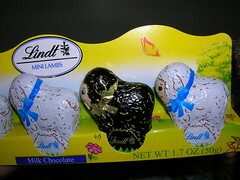 Isn’t the little black sheep precious? I hate to rip the foil, but you can bet that if I don’t, the Knight will. Can you guess what this is? Yep! It’s the cutest tea ball EVER. It’s now offical; I’m going to have to collect novelty tea balls. I had no idea they made anything fancy or silly, but isn’t this fun? Even the metal “tag” on the end is a little slice of citrus. Michelle had been taunting me all week last week about her secret project. Sigh. It was worth the wait! 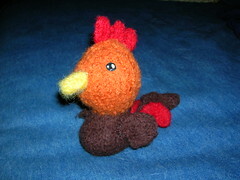 She hand felted this adorable little rooster, bless her heart! He’ll have to find a very high, very safe perch, because Sissy’s reach expands a little every day. Michelle also made me a very sweet cloth with a “profile” head shot of Winnie the Pooh, but I just can’t get a good shot of it. It’s hard sometimes to get a good photo of a cloth, and you know I’m not a great photographer. There’s so much more, but this is already very lengthy, so I’ll stop here for now. There’s a photo of Michelle and me just before she left this afternoon, and much more about tea and friendship, but the Knight wants to take me to dinner, so you’ll just have to wait! PS – Where did spell check go?! WordPress, what have you done!? I had the DEVIL of a time picking the “move me” winner. I finally settled on Jessi, just because I’m all about girl power. There were so many stores that made me laugh. It seems lots of us ate soap, grabbed an electric fence, got caught mooning someone, danced on a table… Really, if you haven’t read the other entries, you should. There are also the warm stories about getting into knitting (or blogging) because of a friend, and I loved the sweet, supportive stories too. In the end though, Jessi’s story summed it all up for me. Because of the love and support from family and friends, it seems we’ve all grown into strong, funny, compassionate women, and I’m glad you shared your stories with me. Honorable mention goes to Alana. One October I went with three friends for a girls weekend away at the lake… the last weekend before the resort closed for the winter. It was cold… really cold. Somehow, my crazy friends convinced me it would be liberating to take a quick dip in the lake at 2 am. Just run in and back out, all while wearing our birthday suits. I was the one that balked, but they managed to drag me along. Wrapped in blankets, we made our way to the edge of the lake, dropped our coverings (not me, I held mine above my head), and ran into water so cold it burned. We must have looked like a quartet of Pillsbury Doughboys waddling along in the moonlight. 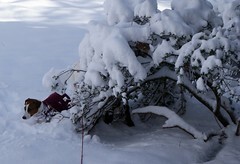 On the way back to the cabin, one of us (though I won’t say who!!) tripped over her blankie and landed on all fours in the sand. It was a “moon to moon” experience, if ya know what I mean!! The most frightening truth: We weren’t kids. One of my friends was a grandma at the time, and the rest of us had grown, or nearly grown, children. Woo Hoo! Never under-estimate the power of a good dare. Hey Jessi?! I’ll spot you about 20-25 years. When you’re a grandmother, meet me at the beach house, and you’d better have a firm grip on your blankie! Alana, you’re my new role model. That’s what girlfriends are for. So for all of you who shared wild tales from your youth, maybe you should reconnect with your inner wild woman. Again, thanks for your stories. You did indeed entertain me! Winners, don’t get in a hurry for your prizes. The rest of this week is hectic for me, so realistically, I’m shooting for Monday at the earliest to get your packages in the mail. Thanks again gals for your friendship and your awesome prizes! Don’t forget my contest ends tonight at midnight. I’ve really enjoyed reading the entries, and just wait until you see the prizes! 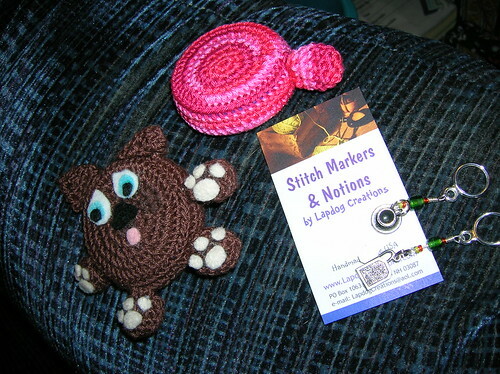 The stitch markers are just part of the set from Nichole. Tea for me, and red and green because they’re Mugsy’s colors. (We’re all about equal opportunity here. It’s like with kids…) Both ladies have Etsy sites linked on their blogs, and I promise you’ll be delighted with anything you purchase from them. It’s canine crack. Seriously. Mugsy has NEVER acted like that before over a treat. Oh, he likes treats, and will do a happy dance and bark a bit, but this was off the charts. He bounced up and down like he was 12 months instead of years. He ripped through the house with Sissy, looking for more. (There is more, but everything in moderation!) 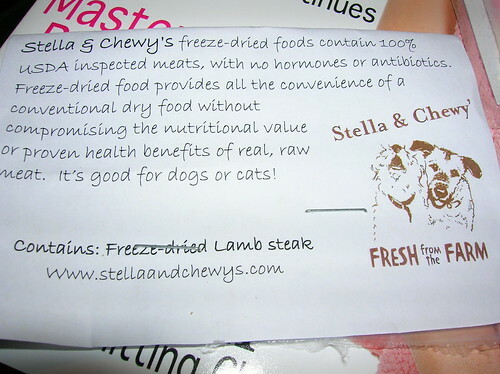 I can’t show you a photo of the dried “cookie” but rest assured, your pup(s) will love it too. So, there are my treats. I love this issue of Knit ‘n Style, and will likely be making the butterfly wrap soon, with several other things marked for someday… The pink kitchner dogtag is now assembled, and Sissy gave that her drool/bite of approval too. (She’s nosey AND cutting her adult teeth, so she’s getting away with more than usual right now.) Nic also sent a couple of really cute bookmarks, which will be put to use soon, because I REALLY need to get back to reading more, even if it is only a few minutes per day. 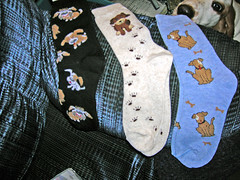 I also picked up some cute socks yesterday. Please note the nose poking up, like she’d miss anything! I have on the blue pair today, because if you don’t own 15 pairs of hand-knitted socks, you still need sock love! So, we need a contest. I started blogging just so I could join swaps, and to kinda’ keep a record of my FOs. Along the way, I’ve met some neat people, and made some friends I suspect are of the life-long variety. Leave a comment below. Tell me a story about something a friend has talked you into doing. Childhood best friend, someone you just met online, whatever. Sissy gets her neediness from me; I need to be entertained! Post the contest on your blog and tell me you’ve done so. You’ll get a bonus entry. The contest will run through midnight on April 1. (No foolin’!) I’ll let the random number generator pick a winner on the 2nd, and the story that gets me – laughter or tears – the hardest will also get a prize. 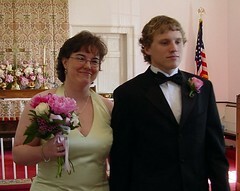 In other news, I hope you’ll stop in and wish Amanda and her family well. 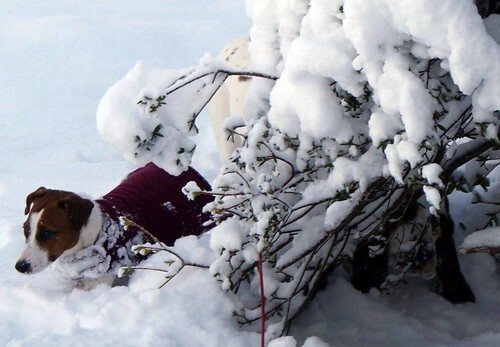 Saying good-bye to a beloved pet is never easy, and when you have to make the choice to be a compassionate owner, it is just one more thing to work through as you grieve. My always helpful, sweet buddy Monica has a birthday on Friday, so wish her a happy one. I’ll be working and in the midst of payroll, so I’m sending you along now, in case I forget! Women multi-task better than men. I don’t know if it’s a documented fact, but it’s sure true in my experience. If you’re not in our Ravelry Group, come join us and celebrate the ability to work and surf at the same time. Share your other favorite ways to make the most of your time too!